590 pages | 16 Color Illus. | 84 B/W Illus. "The authors present an intuitive and easy-to-read book. … accompanied by many examples, proposed exercises, good references, and comprehensive appendices that initiate the reader unfamiliar with MATLAB." "Practitioners of EDA who use MATLAB will want a copy of this book. … The authors have done a great service by bringing together so many EDA routines, but their main accomplishment in this dynamic text is providing the understanding and tools to do EDA. Exploratory Data Analysis (EDA) is an important part of the data analysis process. The methods presented in this text are ones that should be in the toolkit of every data scientist. As computational sophistication has increased and data sets have grown in size and complexity, EDA has become an even more important process for visualizing and summarizing data before making assumptions to generate hypotheses and models. Exploratory Data Analysis with MATLAB, Third Edition presents EDA methods from a computational perspective and uses numerous examples and applications to show how the methods are used in practice. The authors use MATLAB code, pseudo-code, and algorithm descriptions to illustrate the concepts. 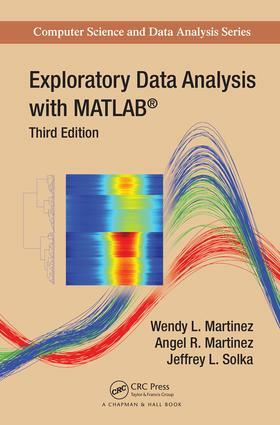 The MATLAB code for examples, data sets, and the EDA Toolbox are available for download on the book’s website. How Many Dimensions Should We Keep? Since 1984, Jeffrey L. Solka has been working in statistical pattern recognition for the Department of the Navy. He has published over 120 journal, conference, and technical papers; has won numerous awards; and holds 4 patents. He earned an M.S. in mathematics from James Madison University, an M.S. in physics from Virginia Polytechnic Institute and State University, and a Ph.D. in computational sciences and informatics from George Mason University.